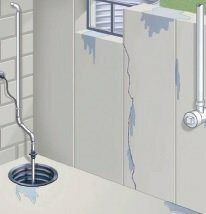 Having wall, floor, or foundation cracks in your crawl space or basement can lead to leaks and water damage. If your home or business experiences problems like this, it’s likely that you will begin growing mold and mildew. This is clearly something that you don’t want, due to the fact that it can cause health problems, and comes hand in hand with a variety of foundation failure or water damage problems. 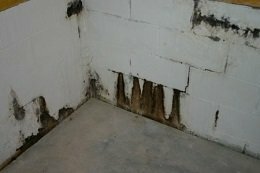 Mold and mildew will continue to grow as long as there is moisture in your basement or crawl space, and cracks due to foundation failure will let that moisture in. Having mold and mildew in your home or business constantly can harm the structure’s inhabitants. If you notice signs such as water in your yard, water stains, or leakage, you may be in need of waterproofing and/or foundation repair. There are a few different things that need to be done if this is happening to your home or business. First, we need to identify if your mold or mildew is due to foundation failure. If you notice cracks in your foundation, it is likely that foundation failure is the cause. In this case, foundation repairs will need to be made. Methods of repair such as helical or steel push pier installations may need to be made. After the foundation failure is taken care of, we can seal up the leftover cracks. This will most likely take care of your problem, but we are also able to install a variety of waterproofing systems such as sump pumps, exterior drainage, or interior drainage. These will all help to prevent future water problems for your basement or crawl space. We are proud to say we offer top quality products from Earth Contact Products, a top producer of foundation repair products. You can rest easy knowing that these foundation repair products will serve you for many years to come. We want to help you feel safe and healthy in your home again. Reliable Waterproofing and Masonry is a team of experienced professionals with the knowledge, tools, and technology to give you top quality foundation repairs and basement waterproofing in Virginia. So, give us a call for more information on our top quality foundation repair and waterproofing methods, our Virginia service area, or call for a free estimate.